As we continue to wade through the unending 80’s nostalgia in film and television, it can be difficult to get excited about yet another story that centers on a group of kids who decide to take on the neighborhood menace which the adults refuse to acknowledge. 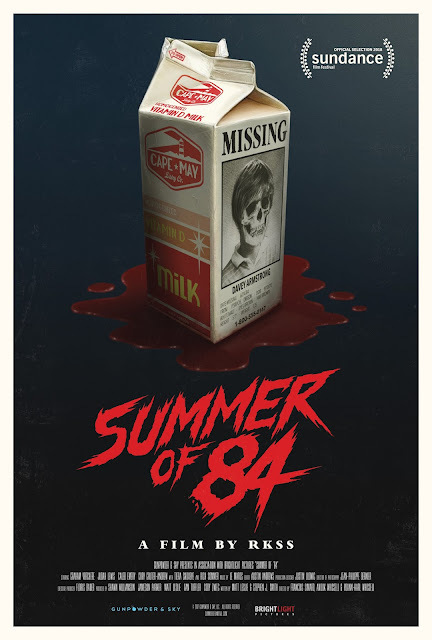 With the now requisite 80’s synth score, timely pop culture references and kids on bicycles, Summer of 84 seems like an easy movie to ignore because at this point, if you’ve seen one, you’ve seen them all, right? Admittedly, I went in with a bit of this jaded viewpoint and enjoyed my personal snarkiness for a bit, but was, blessedly, put in my place by the end of the film. Davey Armstrong (Graham Verchere) is a good kid who delivers newspapers in his suburban neighborhood and it’s this small peek into people’s lives that convinces him that “people hardly ever let you know who they really are” and as the poster states, “every serial killer lives next door to someone.” Add in the nerdy friend (Curtis), the delinquent (Eaton), the chubby kid (Woody), the hot girl next door (Nikki) and you’ve got the basic recipe for Stranger Goonies See IT Through A Rear Window. And honestly, the movie feels very familiar on so many levels, but just when you think you know exactly how this will end, it takes a left turn into seriously dark territory. 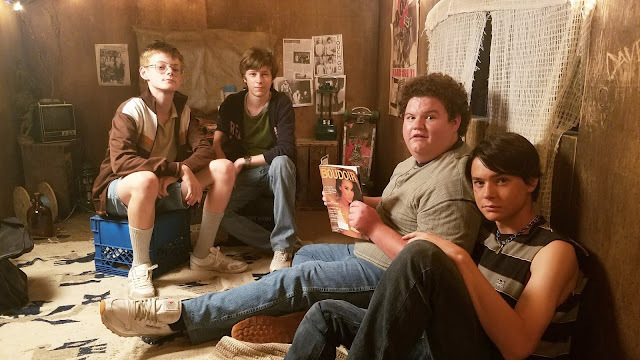 For all of the glory that Stranger Things gets, Summer of 84 is much more spot on with replicating the tone of the Regan era. It was a visually stunning time that celebrated excess and nuclear families while virtually ignoring anything that didn’t fit into this idyllic vision: the perfect time for a serial killer to comfortably live in a quiet suburban cul-de-sac. The love and attention that has been paid to replicating the year 1984 and honoring the movies that shaped the era is stunning. In fact, a very serious drinking game could be made with all of the nods, both overt and discreet, within the film. Thankfully, aesthetics aren’t the only thing worth getting excited about. The reason Summer of 84 is worth swooning over is the story. It’s easy to throw a group of kids together and give them something to obsess over on their summer break, but not every movie is able to subtly and effectively show each character’s weaknesses, thus, endearing you to them and the entire friend group as a whole. As the Cape May Slayer terrorizes the community, Davey and his friends are convinced they know exactly who the killer is and it’s Wayne Mackay. The affable, pleasant, police officer who is always working in his garden and always has popsicles for the neighborhood children. While all of the adults see a man who is a respected member of the community, Davey sees something else and it’s his unwillingness to let this go that will lead him and his friends on a journey that will change them forever. Rich Sommer (Mad Men) absolutely kills it as Mackay. His performance will take you by surprise in some truly chilling ways. Pleasantly, there are a lot of strong performances in Summer of 84. Eaton (Judah Lewis) isn’t just a delinquent because he wears a leather jacket and Lewis does a great job of trying to hide his broken heart with booze and foul language. Woody isn’t just a chubby mama’s boy; he is a gentle soul who takes pride in being the man who is there for his mother and Caleb Emery is so wonderful in the role: with the utterance of one line, he absolutely broke my heart. Verchere plays Davey with such a mix of nativity and bravery that it’s so easy to see your childhood self also eagerly working alongside him. Especially if you’ve ever fancied yourself an amateur sleuth. Even Nikki (Tiera Skovbye) manages to elevate her token hot girl role into someone a bit more complex. Matt Leslie and Stephen J Smith have written a beautiful, dark and twisted love letter to childhood friendships and the evil that lurks around every corner. RKSS (Turbo Kid) have brought their keen directorial eye and fondness for the 80’s to Summer of 84 in the most wonderful ways. It’s the kind of film that lulls you into a false sense of security with it’s beauty and storytelling and then pulls the rug out from under you. The less you know about it, the better. So, grab some retro candy, sit back and enjoy. Summer Of 84 is in theaters on August 10 and on VOD & Digital HD August 24.